Thanks to TLC Book Tours for a copy of the book and hosting the book tour! 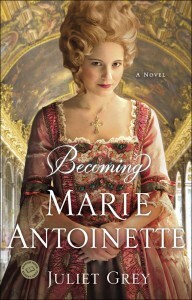 I love historical fiction, I love France, and I love Marie Antoinette; combine all of this and I am absolutely drooling over Becoming Marie Antoinette, Juliet Grey's latest novel. There have been dozens and dozens of novels written about Marie Antoinette, so why should you pick this one up? Why does it stand out? It's beautifully written, Marie is an extremely likable character, and her and Louis's relationship is fun to read about. Yet I think that the title explains it all: it solely focuses on the young, teenaged Marie Antoinette, ending the book right before she and Louis become king and queen. This book is like taking a big gulp of air right before the plunge into the dangerous waters. Marie's childhood was so interesting to read about! Her mother wanted Marie to be as appealing as possible to the future king Louis of France so she commissioned a complete makeover for her daughter. Marie to personality and mental changes as well as awkward physical alterations (a very early form of braces, for one). I just wanted Marie to be able to be a child! When I was fourteen, I was worried about wearing the right brand of shoes, not trying to conform to be able to be married off to a stranger. It was heartbreaking to read the optimism and paintings of a bright future for young Marie, as we all know her eventual fate. I am anxiously awaiting for the rest of this series to come out. With the ease of Juliet Grey's writing and aptitude for characterization, it surely will be a standout in the historical fiction genre, as I've already seen from Becoming Marie Antoinette! Once again, thanks to the lovely folks at TLC Books tours, one of you now has the chance to win a copy of Becoming Marie Antoinette! US/Canada residents only, please. Enter here, you have until August 29th! This book sounds really good! I've always had a fascination with Marie Antoinette (maybe the same-name thing?). Thanks for a great giveaway! So glad you liked it! I have this one coming up soon :) It sounds really good! Thanks for the review! I really, really want to win this book! Thanks for the giveaway! It looks like a great book. Sounds really good. I'm adding it to my to-read list. Thanks for this great giveaway. Can't wait to read this! Don't enter me because I reviewed it too. What a fascinating look at a fascinating woman! I can't wait for the next one and it kills me that it won't be out until next year! I'm excited to know this is part of a series - there is so much detail that can be included when a story is spread out over several books! this sounds fascinating. I am glad to hear about this one. I entered the drawing. Sounds absolutely wonderful. I just love historicals and especially when they are based on fact. Thanks for the chance. I haven't read much about Marie Antoinette. I would love to win this book!